A lemur which escaped from Colchester Zoo was cornered in a garden by police before being recaptured by keepers. 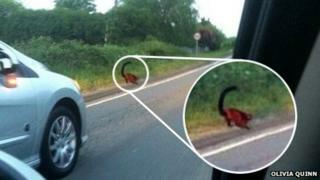 The red-ruffed lemur was seen on the loose next to Maldon Road, Stanway, by motorists on Sunday evening. Essex Police said two officers contained the animal after reports of a "monkey" on the road. Zoo staff arrived 20 minutes later to catch it. Colchester Zoo said the recaptured lemur was "fine". Motorist Olivia Quinn, 18, from Colchester, was on her way to the supermarket when she saw the animal on the roadside at about 20:30 BST. She thought it was a cat or a fox at first, but then spotted it hopping. She tried to call the zoo, while another motorist called the police. "Because we were close to the zoo we thought it had escaped, so we stopped the car to watch so the lemur wouldn't get lost completely," she said. "It wasn't scared, it was just exploring and went and sat in a front garden. "The police came straight away and the keeper came about 10 minutes later. "We were told to get back in our car so we didn't scare it away." In November, three wolves were shot dead after a five-strong pack escaped by breaking through a fence at Colchester Zoo. Three months earlier nearby residents were warned not to approach a wild pig that had gone on the run.